Writer/director Maya Forbes clearly understands and appreciates the enormity of bipolar disorder: the havoc it wreaks on both the afflicted person and their loved ones, especially any children they might have. Her semi-autobiographical film Infinitely Polar Bear fictionalizes the events that happened in her preteen life, a depiction of being raised -- along with her younger sister -- by a father with the condition when the circumstances demanded that he do so by himself for a prolonged period of time. Forbes approaches the situation from a candid, unrestrained perspective on the myriad complications that could arise, never shying away from opportunities to underscore the emotional complexity of what's going on. That ends up being both Infinitely Polar Bear's crucial asset and its persistent limitation, though, as the film shapes into a tumultuous drama with few chances for the pressure of the tension to be truly alleviated, guiding those watching through a potent but restricted portrait that struggles with brighter tones throughout. Mark Ruffalo fills out the mind and body of Cam Stuart, a husband and father to two girls in Boston whom we see flying off the deep end in the initial, troubling scene of Infinitely Polar Bear. In one of his stretches of mania, he's lost his job and frightened his wife, Maggie (Zoe Saldana), and daughters Amelia (Imogene Wolodarsky) and Faith (Ashley Aufderheide), forcing Cam to recover and live in a halfway house while his wife works a crummy job to pay the bills at a rent-controlled apartment. Desperate to change her living situation, Maggie applies to several prestigious business schools, eventually being admitted into one in New York, putting her in a tough predicament with her children. She brainstorms an unconventional, risky plan: for Cam to stay in Massachusetts with the girls and raise them in their apartment while their mother attends school for a year and a half, keeping them in their normal surroundings and giving him more structure and purpose amid a trying period in his life. Reluctantly, with concerns about the responsibility and his role as a man in this scenario, he accepts. Cam's downbeat self-regard and unstable behavior are the driving forces of Infinitely Polar Bear, as writer/director Maya Forbes offers periodic glimpses into their turbulent lives over the course of those eighteen months, often jumping between seasons for effect. It's tough to watch amid heated arguments and volatile situations, amplified by the angered responses from Cam's frustrated children over his parental negligence and peculiar decisions. Down-to-earth moments are few and far between here, likely a consequence of the constrained runtime and of Forbes' dedication towards highlighting the heavier side of that dynamic between bipolar disorder and raising children. The candor displayed by Forbes, channeled through a credible performance from her daughter, Imogene Wolodarsky, as herself at a young age, enlivens these sequences of unfulfilled errands and chores, of embarrassment about the father's unfiltered attitude in public, and of the glimmers of uneasiness that the daughters feel when Cam becomes out of control. Mark Ruffalo goes to a complicated headspace to flesh out this transcendent performance as Cam, reaching deep into the elements of the mental illness to embolden the character's manic episodes and borderline personality ticks. The kinetic detachment in Ruffalo's eyes and mannerisms effortlessly integrate with the brashness of Cam's decisions, which shapes him into a credible force of nature whom writer/director Forbes courageously frames as an unpredictable parental figure, strengthening the autobiographical backbone of Infinitely Polar Bear. From his impulsive departures out of the apartment at odd and inconvenient hours to the, uh, modifications he makes to the place while he's there, the film navigates through some rather disconcerting and out-there situations, all of which are constantly grounded by Ruffalo's realization of that persona. He's counterbalanced by the compassion and concern that radiates from Zoe Saldana as his wife, whose struggle to balance her own necessary ambition with what's right as a mother comes through loud and clear through the actress' raw expressiveness. Thing is, Infinitely Polar Bear does approach some lightheartedness within the extreme moments of Cam's condition, rendering a film seasoned with endearing and uplifting tones that at times run counter to what's really going on within the Stuart clan. 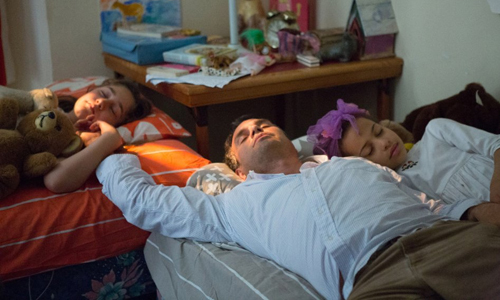 There isn't much focus on any middle-of-the-road, steady periods in their household, forcing the film to find levity within how the two daughters tolerate and adapt to the their father's upsetting highs and lows -- his abrasiveness and his acute enthusiasm -- something that's really tough to do. Sincerity appears in every frame, since writer/director Forbes still clearly strives to convey what the situations really felt like at the time, and she takes that complicated fusion of sensations and ties them together into an admirably feel-good depiction of weathering the struggles of bipolar disorder, underscored with an assuring message at the end. Infinitely Polar Bear comes across as a deeply personal film that wants to achieve more than that with its intentions, though.